Bead weaving can be a daunting endeavor. We all have different skill levels. Chances are if you’re reading this, you’ve at least dabbled in beading. Some of the more advanced bead weaving patterns can be very intimidating for a lot of beaders. “Quick and easy” patterns are approachable for beginners but rewarding for everybody! The Scarabtino Bracelet by Kathy Cook is a mind-bending puzzle of shapes and colors, but with the larger multi-hole beads, you’ll be done in no time! 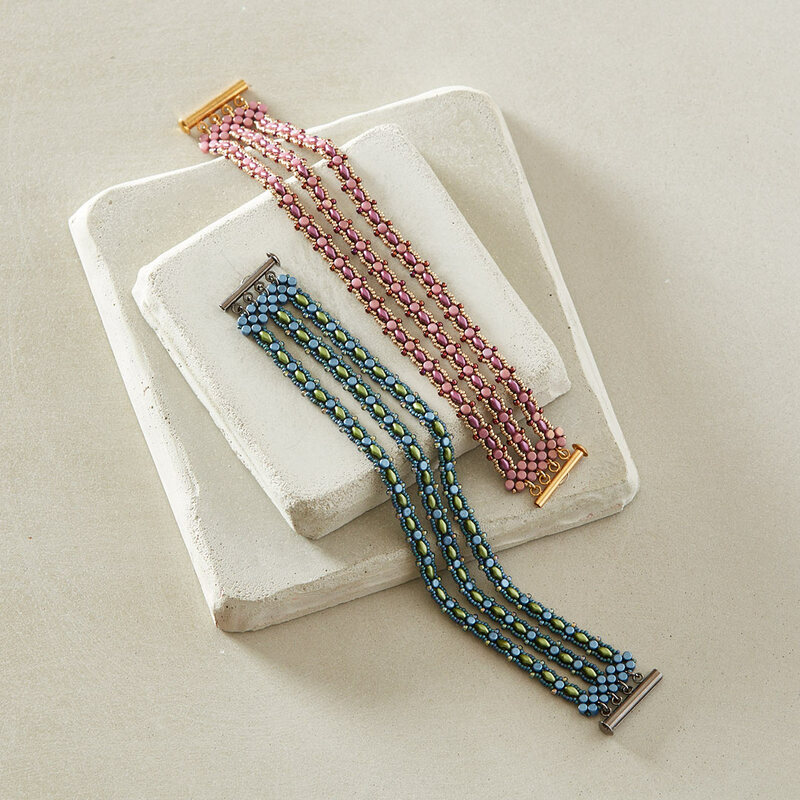 Lisa M. Jordan’s Abacus Bracelet has an intriguing texture that is easy and meditative to weave. 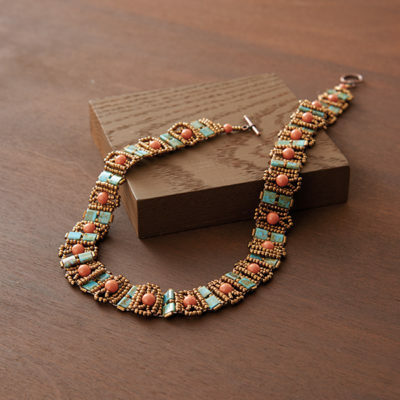 You won’t believe how simple it is to stitch the Boardwalk Necklace by Alice Kharon—it is gorgeous! With 10 beautiful patterns in this collection, you’re sure to find something you love. Flip through the lookbook to get a sneak peek at the projects—I bet you’ll find a few that you can’t resist! 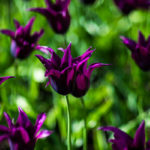 The small time commitment of each pattern means that making a couple of these projects can fit into any busy schedule. Even though I’ve been beading professionally since 2006 (and don’t shy away from even the most complicated of bead weaving patterns), I still find that my favorite patterns come from Beadwork magazine’s Quick + Easy special issues. Simpler, faster patterns can be rewarding for everybody—and you might just learn something new along the way! Ever since I learned about Zentangle, I’ve been viewing my beading endeavors as more of a practice than a task. If I’m attempting a new pattern—or even just futzing with beads to see what I can come up with—I try not to get wrapped up in getting to the outcome. I focus on just enjoying the creative process. I find that “quick and easy” patterns are the perfect tool for my “beaded meditations.” They are a great resource for creating something beautiful without the frustration or weariness that longer, more complicated patterns can cause. Of the beautiful patterns in the new Quick & Easy eBook, the one I’m obsessed with is the Minos Faux Wrap Bracelet by Kim West. I love the balance of simplicity and impact in this bracelet. The use of Minos par Puca beads and SuperDuos tickles my geometric fancy, but the design also has an elegant feel from the seed bead embellishment. 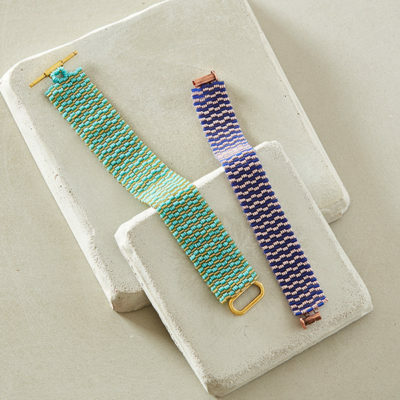 The clever use of right-angle weave for the clasp attachment takes what can be an afterthought or eye-sore and turns it into the focal part of the bracelet. Wrap bracelets are a lasting trend. Try this new take on the look! The best part? You can get this lovely design in a kit. Our kits are always popular, and for good reason: Kits take all of the guesswork out of finding the right colors, and you can get right down to business and start stitching! Which of these Quick & Easy patterns will you make? Let us know in the comments. Also, please submit to W.O.R.D. (What Our Readers Did) by sending photos to beadworksubmissions@interweave.com and including “W.O.R.D.” in the subject line. 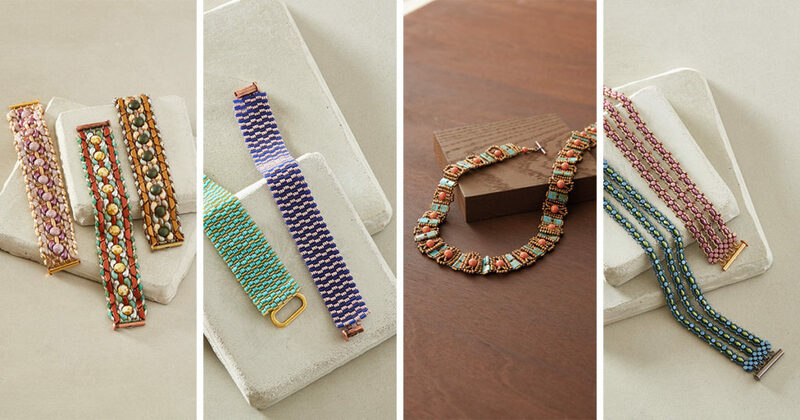 Featured Image: A selection of bead weaving projects from the Quick & Easy eBook. 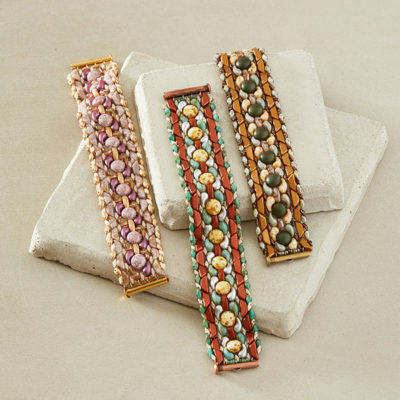 Try your hand at these approachable and rewarding bead weaving patterns today!